Today for Lhakar, six alums of the Lhakar Academy joined the new class of participants in attending a historic ceremony in Dharamsala held by Students for a Free Tibet. We all came dressed in our chubas excited to attend the public unveiling of a re-creation of the Tibetan Proclamation of Independence, issued by His Holiness the 13th Dalai Lama. As we watched the 12 foot-long handwritten scroll unfold to the ground I could tell each one of us was holding our breath in awe of the meaning of this beautiful replica. The scroll was bordered with brocade and silk in the style of a thangka, and was unveiled to an crowd of several hundred Tibetans and supporters including many our friends and colleagues from around the world in anticipation of the upcoming centenary of the declaration in 1913 that proclaimed the restoration of Tibet’s independence following a Manchu invasion. The scroll was unveiled by Ven. Palden Gyatso, Tibet’s second longest-serving political prisoner who was born in the time of the 13th Dalai Lama’s government. 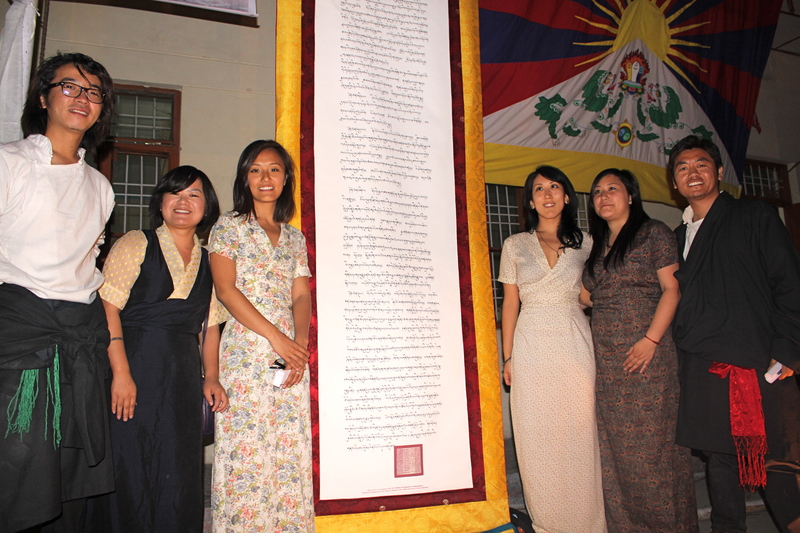 We hope this scroll will give Tibetans everywhere a reason to celebrate our history as an independent nation. The history of Tibetan sovereignty is indisputable, and it forms the basis of unity in our struggle to reestablish a free Tibet. A century after the issue of this proclamation, Tibetans of this generation are engaging in concrete nonviolent actions such as noncooperation and civil disobedience to construct our social, political, cultural and economic independence from Chinese rule. Although China controls Tibet’s borders, it has already lost control over the Tibetan people’s actions. What was also quite amazing was the fact that both Palden Gyatso and Narkyid Ngawang Dhondup were born during the same time as the reign of the Great 13th Dalai Lama. It is really something to think that next February of 2013 will mark 100 years since Tibet proclaimed the restoration of its independence. Here’s a little historical background about the scroll. The Manchu army sent troops to Tibet in 1909, prompting the 13th Dalai Lama to escape to India. However, as the Manchu dynasty succumbed to a Chinese revolution at home, Tibetans expelled the Manchu troops from Tibet. The 13th Dalai Lama returned to Tibet and issued a proclamation to mark the restoration of Tibetan independence. The text of this proclamation has survived, though the original document has not. As alums of the Lhakar Academy and six contributors to Lhakar Diaries, we all felt incredibly lucky to have witnessed such a moment in Tibet’s history.